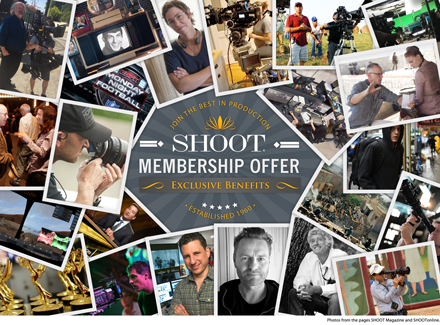 Invest In Your Future Success With A SHOOT Membership! In today's highly competitive environment, getting noticed by industry decision-makers is no easy feat. Because your potential collaborators & clients read SHOOTonline, SHOOT's 4 email newsletters, SHOOT Magazine and the SPW to stay connected to what's going on in the industry and to learn about resources important to their everyday business and future growth it makes perfect sense to promote your talent, work & news in the same highly targeted environment. Membership provides access to all SHOOTonline Databases & SHOOT Print PDF issue archives, a link to your website will be embed in all past & future SHOOTonline articles in which you or your co. is mentioned ­and you can set up a MySHOOT Company and / or Talent Profile and MyNewsroom. SHOOT is opening up it's content databases for members to easily add, select and curate content for placement on websites, MySHOOT Profile pages, and beyond. With SHOOT's NewsRoom feature a member can create and manage a news page on their website with ANY web content they choose to curate including SHOOT News, Features, and Screenwork videos from our archives, SHOOT Publicity Wire (SPW) releases, SPW Interviews, and SPW Video postings, and any external news and features from 3rd party sites both B-To-B and consumer that's relevant to visitors on your website. * Please call SHOOT support at 203-227-1699 x13 for “Custom” Member Level if you have more than 3 companies/divisions. Registration required to purchase additional services (i.e. SPW services, NDS entry, etc.) Upgrade membership anytime. Once you become a SHOOT member, you can start creating your MySHOOT profile anytime. Uploading your profile copy, photos, logo and reel is easy. Click Here to view How to Screencast. If you don't have the time to set it up, SHOOT is offering a set up service where we will find, gather, polish up and post your information and reel/reels for your approval and then show you how to keep it up to date. Face to Face with New Connections and New Information Get "Face to Face" with the future of film, TV and commercial content creation and some of the innovative executives and artisans on the forefront. Join The Editors of SHOOT along with our sponsors, each May, at the DGA Theatre in NYC, for an informative and entertaining afternoon of the Annual SHOOT Directors/Producers Forum panels and speakers, followed by a fun-filled evening including the debut screening of SHOOT's Annual New Directors Showcase reel, panel introducing the new directors, and after-party.